Welcome to Day 98 of our Divi 100 Marathon. Keep tuning in for 100 days in a row of awesome Divi resources as we count down to the amazing release of Divi 3.0 on the final day of the series! Today we are proud to give away the final layout kit of the Divi 100 Marathon: our Free Divi Coming Soon Pages Layout Kit. This kit contains eight new coming soon page layouts for you to use as starting points for your own pages or to simply replace the content and run with. Enjoy! To use the Free Divi Coming Soon Pages Layout Kit on your own Divi website you will first need to download it using the button below. Next, locate the file divi-100-coming-soon-pages-layout-kit.zip in your downloads folder and unzip it. Then, navigate in your WordPress admin to Divi > Divi Library and click the “Import & Export” button at the top of the page. Once the import has finished you will now have the ability to load your new Divi Coming Soon Pages Layout Kit on any builder powered page by going to Load From Library > Add From Library. You will also be able to load individual sections via the in-line “Add From Library” controls within the builder. Every layout in this kit is an individual section. You can load the entire kit with all sections by loading from the Load From Library > Add From Library controls at the top of the Divi builder. This is great for mixing and matching elements between sections to come up with new designs. You can also load each individual section by going to the in-line “Add From Library” controls in the section controls within the builder itself. Tomorrow: What Happens After Divi 100? In tomorrow’s blog post Nathan will explain what we have in store for you after the conclusion of the Divi 100 Marathon. While there will be a return to more general WordPress and web design content, we’ve got a lot of new (Divi related) awesomeness still in store. Find out all about it tomorrow! 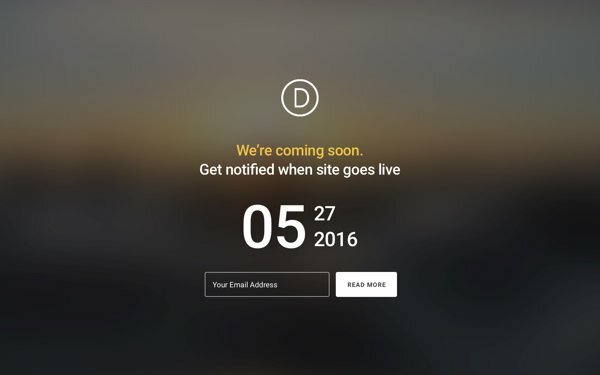 Very clever to put the coming soon layouts when DIVI 3 is literally coming soon! The collection of layouts given during this 100 days is nothing short of awesome, and so much appreciated. It has inspired me to start creating my own layouts to share soon. Thanks for the layouts, and looking forward to Wednesday! It’s going to be epic! couldn’t come on a better time for me 😀 thanks a lot for all the awesomeness shared during these 98 days! 2 mooooreeee!!!! Amazing, full of praise! I have done the downloads are all stored in my Divi Library for future projects that intend to create. ET is and always will be congratulations, and I can not wait Divi 3.0 born! Yeah, right on time. Thank you very much Mario! 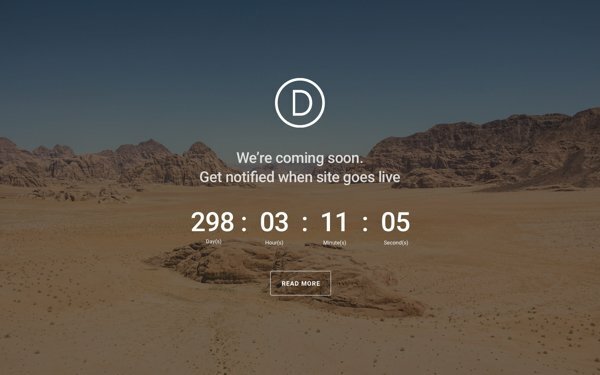 The divi 100 days countdown was a great content strategy idea!!! I hope you dont want to stop with your content after publishing the new version! Looks like the wait is finally over. Have you received the 3.0 update? Actually exited after visiting this page for 100 days. This is a great layout to use and is consistent with the rest of the site. Now, it simply creates the page, but is there a way to force the site to use that one page or redirect to it? I know that some answers are to use a Maintenance plugin, but do those allow the option to use this particular page when made with one of the above layouts? Thanks! It is nice to see fresh ideas on styling Coming Soon page. Only if I could fast forward time. 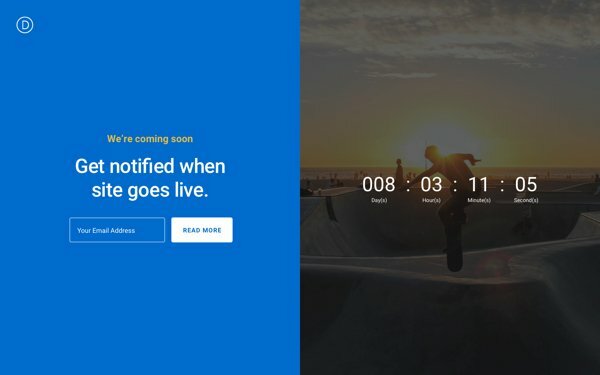 How do you use the coming soon page, but still keep the site active if you are signed in. We want to work on the site without the public seeing it. 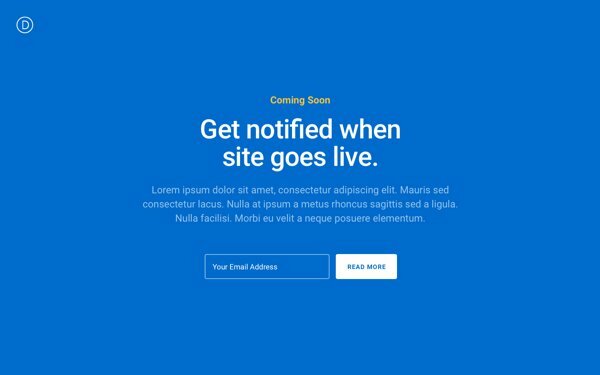 Set the Coming Soon page as the Front Page in Divi theme customizer. 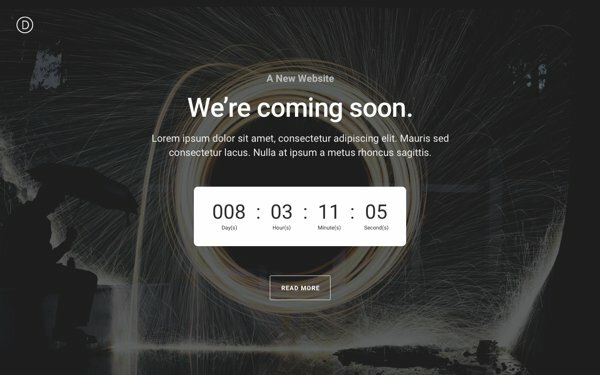 Set the Coming Soon page as the Front Page in the Divi theme customizer. Thanks! This is perfect (and perfect timing)!! I’ve just recently moved to a self-hosted website and I started using DIVI over the weekend, so I’m still learning the ropes. This is the perfect solution to give my website a beautiful coming soon page while I create awesome pages with Divi. I look forward to the new Divi – I hope it’s not too complicated, as I’m still trying learning the current version. Thank you for all the great posts and freebies you’re providing. 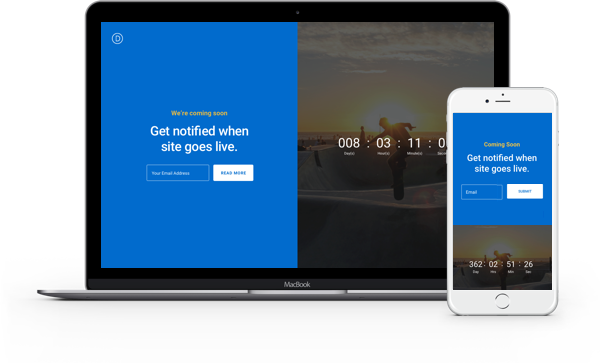 Tick tock…..web design with Divi 3 – all the videos are nice but hands-on testing is what I’m looking forward to. Hello, thanks for the stuff you have been bringing to us in this marathon. I have a question that it has been on my mind lately. Will there be a way to choose any of the DIVI builder user interfases, in order to get us used to the new one?.. Thank you. Awesome. I really wondered what you were going to find to say for 100 straight days, but there hasn’t been a day where I haven’t learned something. It’s been excellent. All the best with divi 3 and on! Great content, great marketing. Well done! Thanks for the layouts, and looking forward to test Divi 3. I’m confused. Are these layouts that have been released over the past 98 days for the current (soon to be old) Divi Theme? So far, I have only been using the Divi Builder Plugin with another theme (Headwaythemes). I anticipate that, after the new Divi 3.0 comes out (is it a theme or a plugin? ), I will want to work with that. 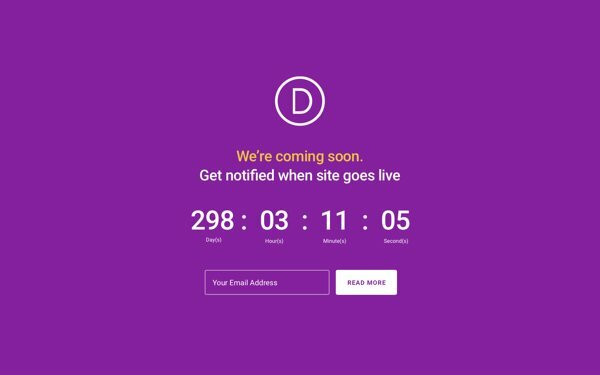 Will the layouts that have been released during this 100-day count down work with the soon to be released Divi 3.0, the old Divi theme, and/or the Divi Builder plugin? All the layout we’ve been downloading will work with Divi 3.0. Think of it as a complete package to the new Divi 3.0. You’ll not only have Divi, but a bunch of layouts to help you get started building websites that suites your needs. Using Divi 3.0 and Headway themes would only be redundant use. It’s like having to hammers of the same size. I think you’ll find Divi 3.0 much easier to use with the ability to tweak your websites to do things that most theme builders can’t do. 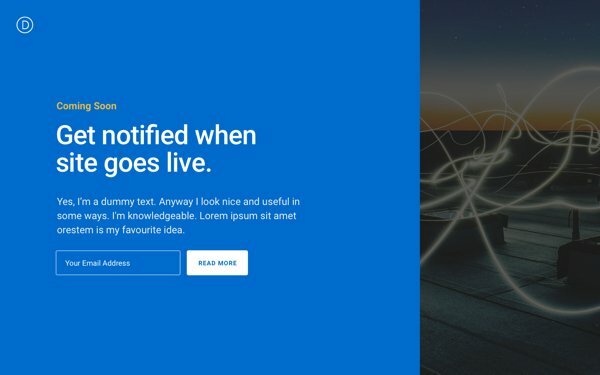 Do the email optins for these layouts connect to ConvertKit? Yes, I would love to know when the ConvertKit integration will be available. I want Divi 3.0 but it has to play well with ConvertKit. Gravity Forms already has CovertKit integration. So you can just use a GF form shortcode in a text or code module. Hi, should the images in example 4, 6 and 8 (the vertical images) be included? I`m missing them. And the buttons from the forms are all under the inputfield, how can i get them horizontally as in the demo? In the Divi Coming Soon Layout 06 example how do you get the submit button on the same row as the email field? They have been extraordinary these 100 days. Thank you very much for all the material delivered! Thanks a lot for all the awesomeness shared during these 98 days! 2 mooooreeee. …do we have to use Mandrill or SendGrid with this form? How can I change the color of the text for the captcha? Can other forms be integrated? As much as this may seem simple to many, have patience with others! In last 15 years of web design career never followed any blog for such a long time with this much decipline and excitement. I love the way DIVI as aproduct conceptuakize and the they way it is growing. Certainly there must be lots and lots of hard work from team DIVI. Clean and simple templates. Really like them. Can hardly wait for tomorrow.. The excitement of loading the new Divi 3.0 for my clients and having them be delighted with the experience is too hard to contain. Love Divi and ET! You guys rock!. Only 28 hours to go! Thank you for these. I love learning how to make the Divi theme work for me. Having the ability to tweak all these different aspects is great. Let me tell you that these are awesome. I’am wondering, what this “coming soon layout pages” have to do with the ANTICIPATE PLUGIN that is used for similar purposes? 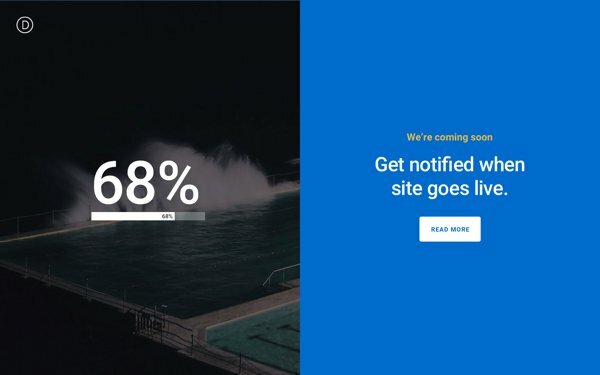 Do they work with the Anticipate plugin? Have they the same functionality? Can be activated and deactivated like the Anticipate plugin? Do they stop the accses to the site while you work in the back like the Anticipate plugin? Please give us more detail. I’m currently using the Anticipate plugin offered by ET. The problem with the plugin is you really can’t modify it. With this new ‘Coming Soon’ layout, you’ll be able to change the look and feel of your coming soon page. I for one am very excited about this and plan on switching it out for this awesome layout. I agree with you. In Anticipate is little what you can do to modify it and these are very cool designs and can be modified. I’am concerning about their functionality. They can be used as Homepage, they said, but I dont know if it blocks all the site or just the Homepage. I would like further comment from a ET staff person on this details. Clicking submit doesn’t seem to actually send an email. Besides putting in the email address to receive emails in the module, what else do you have to do? I just have to use theses layout but how can you put them without any header/footer ? It’s a thing I never did with Divi and I can’t find how to do it right now! The blank template is still available where it always has been. If you’re in the page editor (on the backend) there is a meta box called “page attributes” where you can select the blank template from a dropdown. Will the pre release plugins and coming soon pages work with Divi-3.0 Live Visual Builder? Hi everyone, new to Divi and WordPress. If I install this layout, can I still build a website so that people see coming soon page until I am ready to make my website live? How do I do that? What plugin do I need? A little “fail” in this layout, is that your navbar still is visible on the Comming soon page.. Anyways, you can just create a new page, and choose that page as the “mainpage” of your WordPress page. But, in this layout I miss a tweak that totally removes the navigation bar. Nvm! You can offcourse choose “Blank page” on “Page artibuttes”.